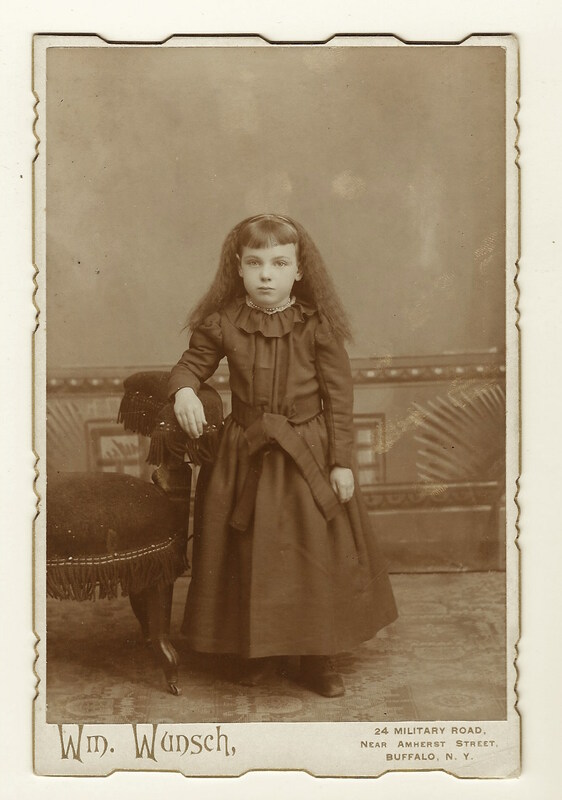 This cabinet card portrait features a charming little girl wearing a long dark dress and a serious expression. The photographer of this image is William Wunsch (1846-1929). His obituary, which appeared in the Buffalo News, indicates that he was a war hero. As Wunsch requested, he was buried with three war medals (including the Gold Cross). Wunsch was a lieutenant in the Franco Prussian Wars and he was decorated for bravery. He came to the United States in 1871 and was granted citizenship in 1876. He was married to Sophia E. Steinmetz Wunsch (1878-1949). He resumed his Prussian career as a photographer after immigrating to the United States. He was very active in the German community of Buffalo, particularly with singing societies. Wunsch was still a photographer at the time of his death even though he was 83 years old. He is buried in Buffalo’s Forest Lawn Cemetery. Judging by the scalloped edges of this photograph, the image was produced sometime after 1886. 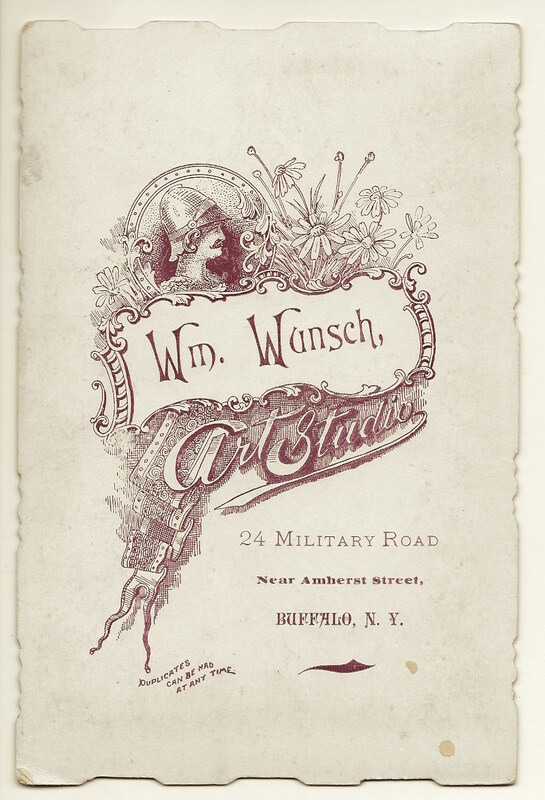 Wunsch’s studio was located on Military Road at least between 1878 and 1927. It is interesting to note that this war hero photographer located his studio on a street called “Military Road” and used a military figure in his business logo which can be seen on the reverse of the cabinet card (see image below). 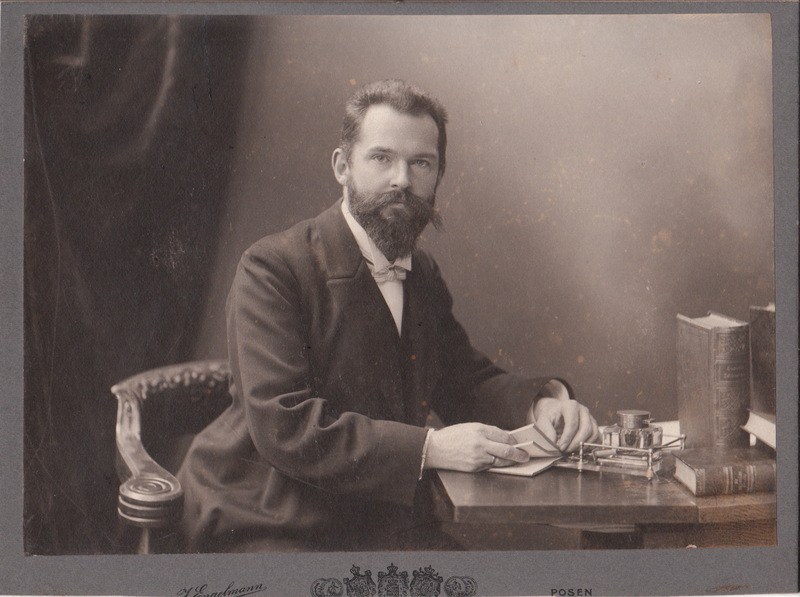 A handsome well dressed gentleman sits at his desk and poses for this portrait by the Engelmann studio in Posen, Poland. At the time of this photograph, Posen was a province of Prussia and part of the German Empire. The man in this photograph appears to be a professional of some type. Perhaps he was an attorney or politician. He is leafing through some papers and looking at the camera. Note the large books (journals?) and the inkwell on his desk. He is wearing a wedding ring and a bow tie. 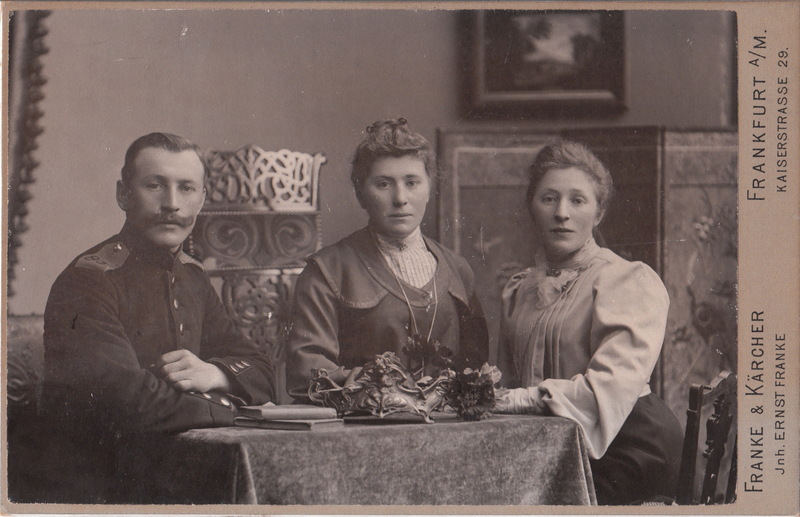 This cabinet card features a military officer and two women seated at a table. All three individuals appear quite austere. On the table are two small books and a bowl with contents that include a pair of scissors. Perhaps this is a family photograph, but there is likely an interesting story about the lives of the subjects in this photograph. The photographer of this image is Franke & Karcher of Frankfurt. At the time of this portrait, Frankfurt was ruled by Prussia.